For the LAS Imaging Group albums on Flickr. 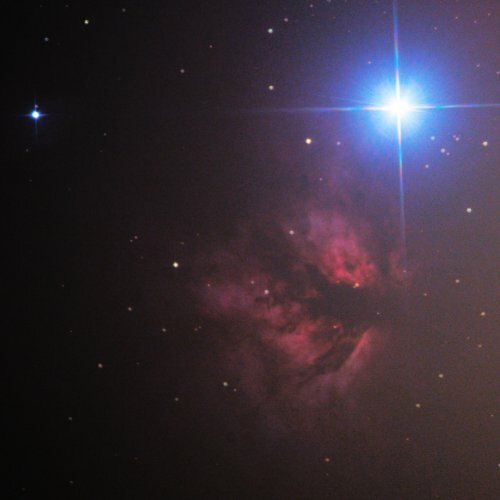 Dave McCracken took this image of the Flame Nebula from his Skellingthorpe Observatory in January 2019. 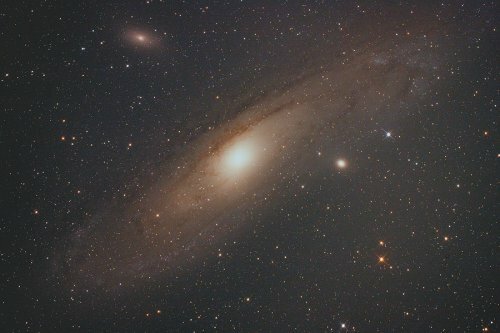 Dave McCracken took this image of the Andromeda Nebula from his Skellingthorpe Observatory in August 2018. Street lights and the local public house flood lights illuminated the site before midnight. Graham Winstanley took this image of the Draco cluster NGC5981/ 5982/ 5985 in April 2018. He used his Skywatcher ED80 and QHY IMG2PRO camera. Baader LRGB filters were used and exposures were L 20 x 600s; RGB 20 x 120s per filter. 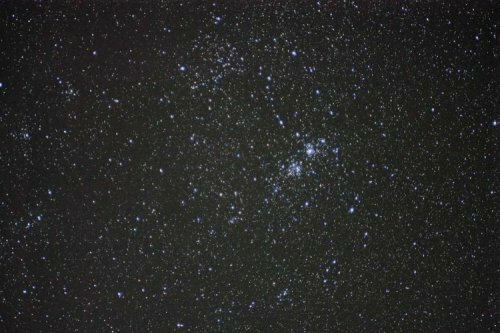 Graham Winstanley took this image of the Double Cluster in Perseus in February 2018.Using a Canon 1100D with a Pentax Super Takumar 200mm lens. 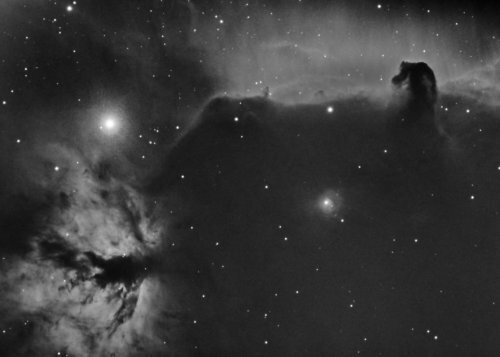 Graham Winstanley took this Hydrogen Alpha image of the Horsehead and Flame nebulae in Orion.Using his Skywatcher E80, Pier mounted on an EQ6. The camera was a QHY IMG2PRO at -20 deg with an off axis guide camera ASI120MM. 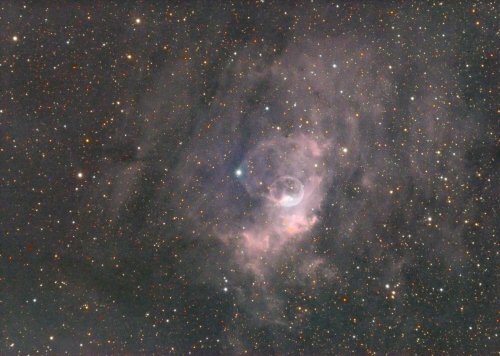 Graham Winstanley took this image of NGC7635 the Bubble Nebula in November 2017 with his Skywatcher E80 mounted on a EQ6 mount. The camera was a QHY IMG2PRO at -20 deg with an off axis guide camera ASI120MM. Phil Norton took this image of the Eudoxus region of the Moon on 25th November 2017. 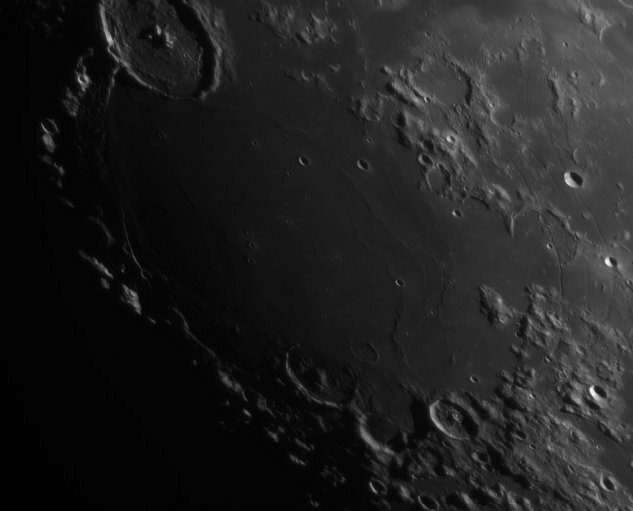 He used a Skywatcher 150PDS scope with a x2 Barlow and ASI120MM camera. Processing was with AutoStakkert and AstraImage 3.0. 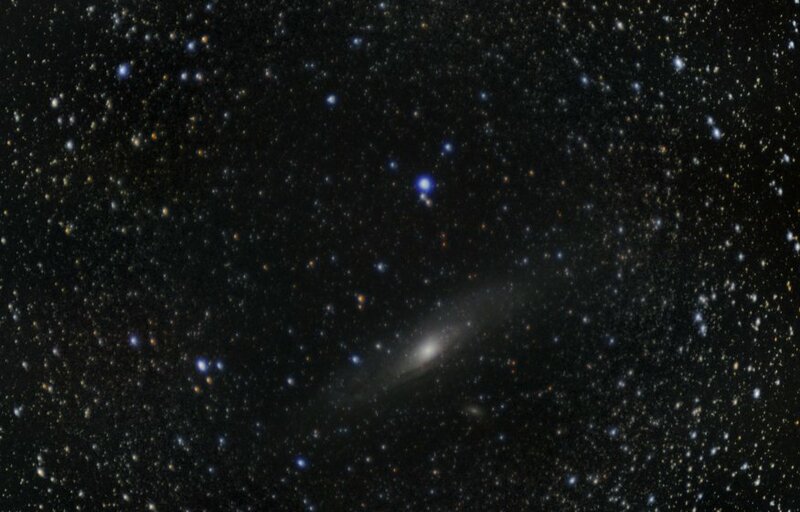 Graham Winstanley took this image of M31. 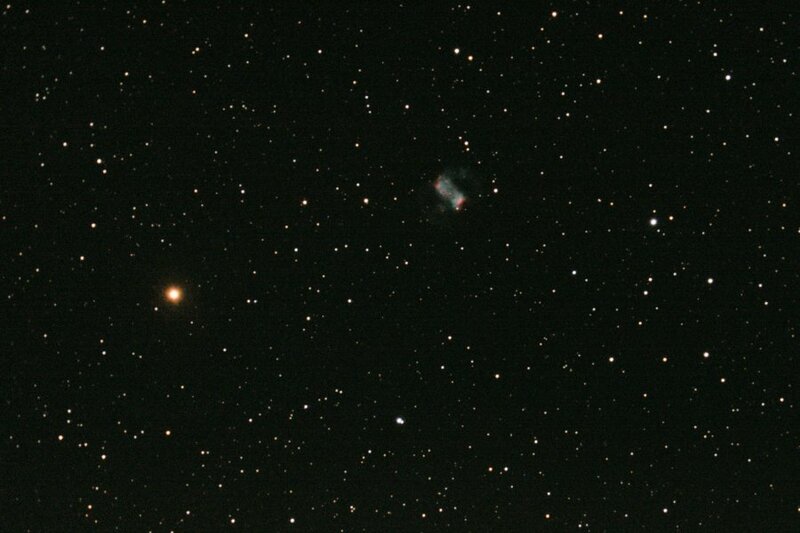 This is what can be done with poor data from a camera and cheap 135mm lens on an EQ1 motorised mount. The M42 screw thread lens was bought on ebay for £11.50 including postage with £3.50 Canon adapter. The camera is now rather old, an 1100d. The mount has a motorised polar axis but the battery was very low so didn't move fast enough to track properly. Hence, only 10 sec exposures - 19 minutes worth. The result was that each frame moved slightly so he had to crop quite a lot to remove the dark edges. 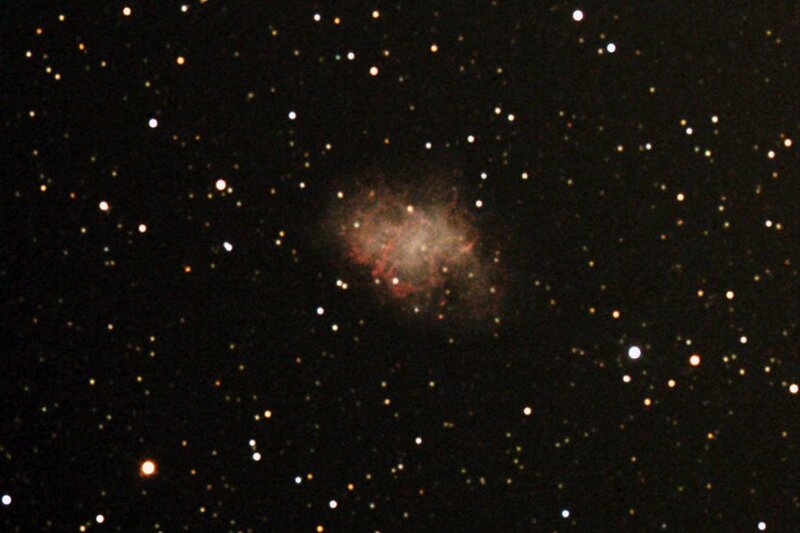 Dave McCracken took this image of the Crab Nebula from his Skellingthorpe observatory on 28th October 2017. 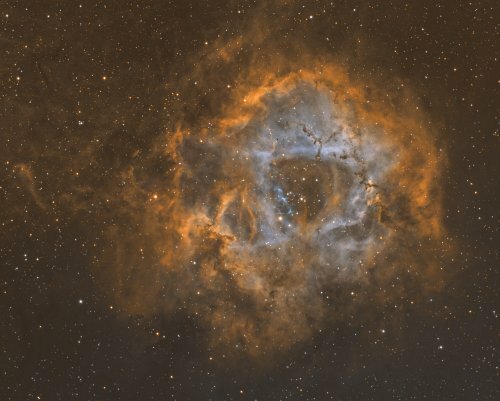 He used his Skywatcher Explorer F5 130P with a Coma Corrector on an EQ5 mount. The camera was his Canon 450D (modified). Exposures were 10x180s 800 raw. Processing was with Deep Sky Stack with Light + Darks. Kappa Sigma 3/5 then Photoshop CS2 Levels, Curves & Crop. 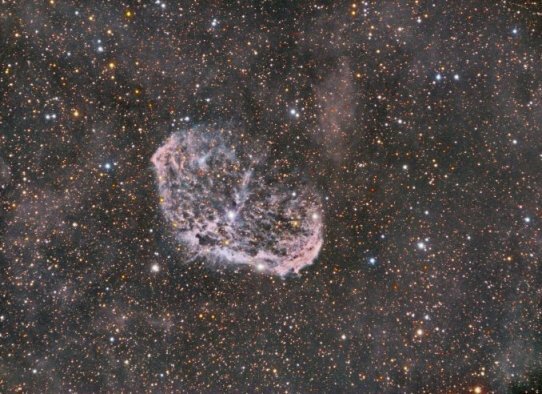 Graham Winstanley took this image of the Crescent Nebula from his Observatory at Bassingham over several nights from 31 August to 17 September 2017 using Sequence Generator Pro. He used his Skywatcher ED80 on an EQ6 mount with a QHY IMGPRO camera at -20 deg. Guiding was with his ASI120MM camera using PHD2. Exposure was Ha 20 x 10m, RGB 20 x 5m each per filter. 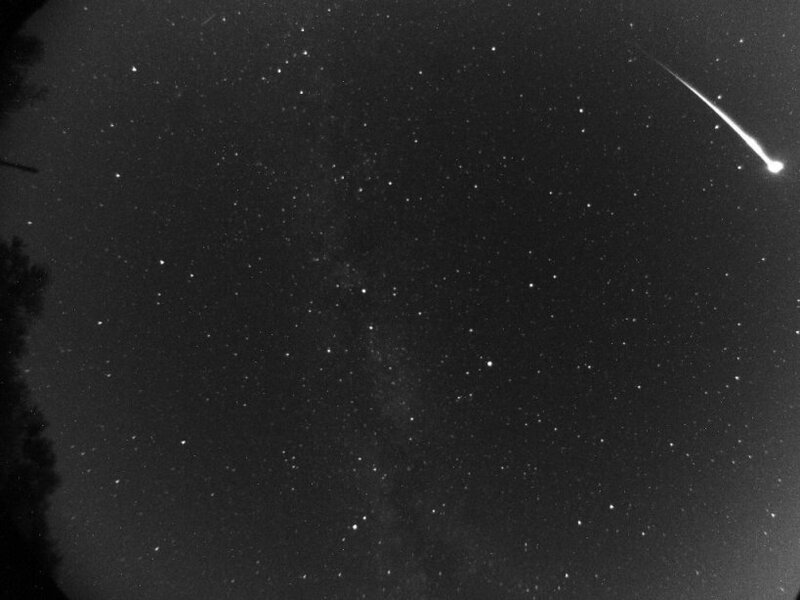 Graham Winstanley took this image of a Perseid fireball from his Observatory at Bassingham. It is a 10 sec video frame using a ASI120MM camera with 150 deg lens. Dave McCracken took this image of the Little Dumbell from his balcony observatory at Skellingthorpe on 23rd August 2017. He used his Skywatcher Explorer C8 200 with a F6.3 Coma Corrector on a Celestron Alt-Az Fork with Wedge. The camera was his Canon 450D (modified), focused with 8" Bahtinov mask.Settings were 23x20s 1600 raw. Processing was with Deep Sky Stack of best 50% Light + Flat + Bias + new Darks taken on the night, Kappa Sigma 3/5 then Photoshop CS2 Curves, Crop & Brightness/Contrast. 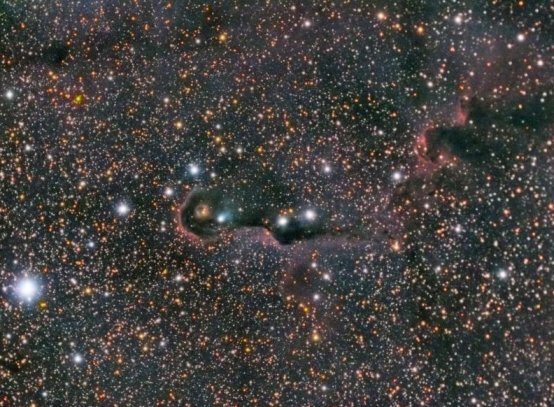 Graham Winstanley took this image of the Elephants Trunk Nebula from his Observatory at Bassingham on 24th May 2017. He used his Skywatcher ED80 on an EQ6 mount with a QHY IMGPRO camera at -20 deg. Exposure was L 16 x 600s, RGB 20 x 300s per filter. 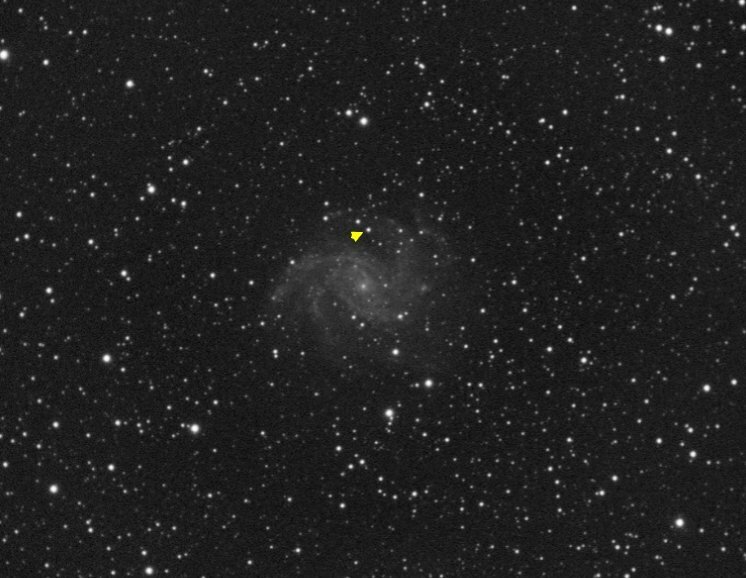 Dave McCracken took this image of a possible Supernova in galaxy NGC6946 from his Skellingthorpe Observatory between 00:30 and 00:59 UT on the 21/22 May 2017. He used an Explorer F5 130P telescope with a Coma Corrector on an EQ5 mount. Guiding was using the 50mm Finder + QHY5L-M camera with PHD v1.14.2 software. It is a composite of 10x180s 800 raw images with his modified Canon 450D camera. 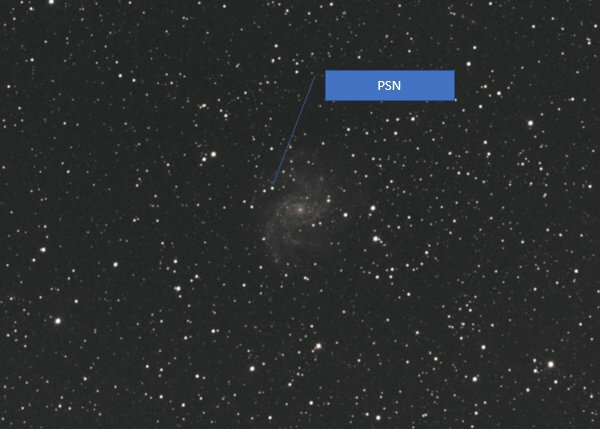 Graham Winstanley took this image of the Supernova in NGC6946 from his Observatory at Bassingham on 14th May 2017. 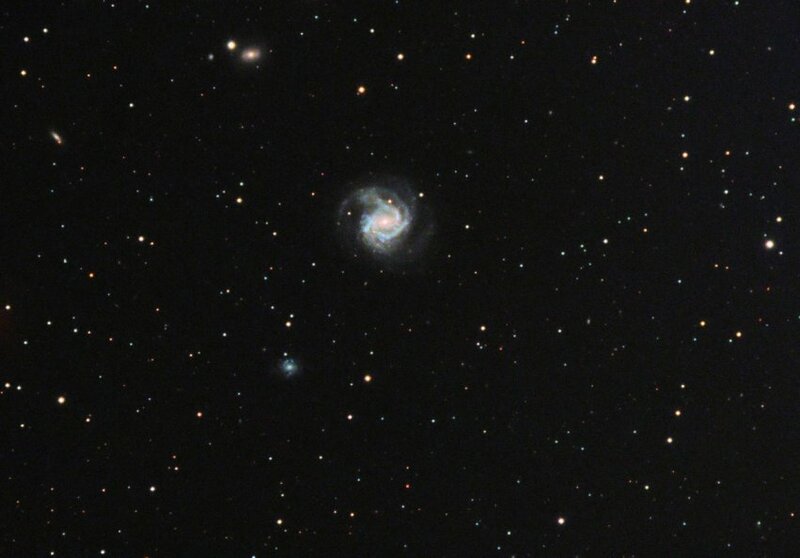 He used his Skywatcher ED80 on an EQ6 mount with a QHY IMGPRO camera. Exposure was 10 x 120 seconds. Graham Winstanley took this image of the M61 galaxy from his Observatory at Bassingham on 25th March 2017. He used his Skywatcher ED80 on an EQ6 mount witha QHY IMGPRO camera. Guiding was using an ASI120mm camera with PHD2 software. 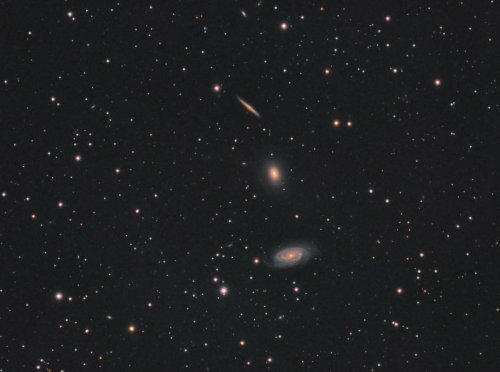 It is a composite of 20x300 seconds luminance and RGB 20x200 seconds per filter. 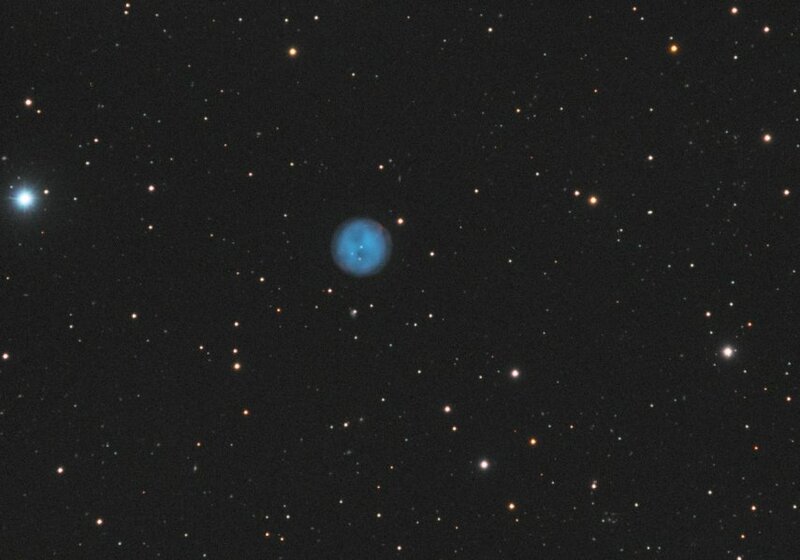 Graham Winstanley took this image of the Owl Nebula from his Observatory at Bassingham on 16th March 2017. He used his Skywatcher ED80 on an EQ6 mount witha QHY IMGPRO camera. Guiding was using an ASI120mm camera with PHD2 software. 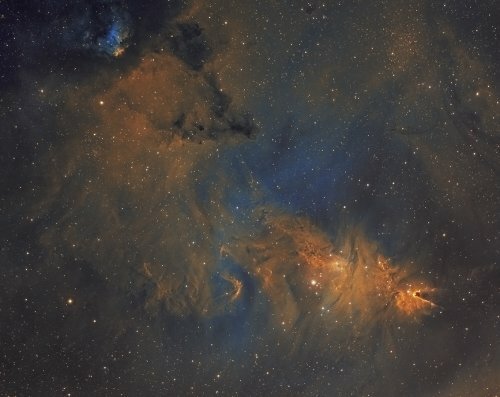 It is a composite of 20x5 mins luminance and 20x4 mins of each RGB filters. Graham Winstanley took this image at the end of January. It is a quick stack of 10 x 60s subs on Comet Johnson from one Sunday morning at about 5am. It was moving very slowly but there is some trailing if you look closely. 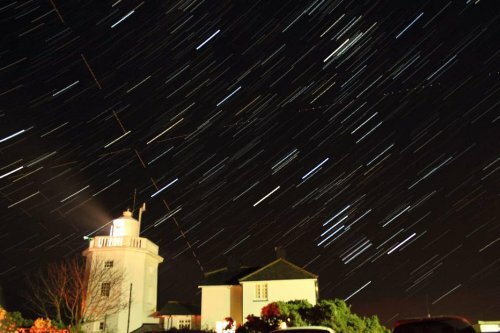 Graham Winstanley took this image on December 5th 2016 using a Canon 1100d with kit lens at 18mm, f4, iso 1600. It is a stack of 60 x 10s exposures, stacked in Startrails. Just in case you can't tell it is Gemini and Orion! Mick Hunt took this image of NGC 2264 - The Cone Nebula + Foxfur + Christmas Tree cluster. 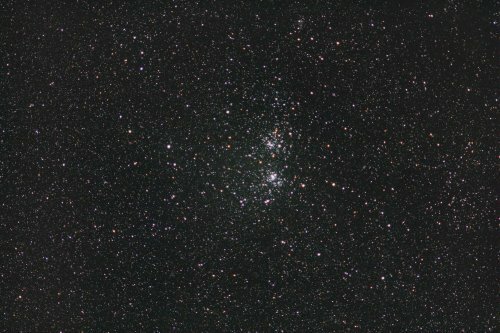 Graham Winstanley took this image of the Double cluster using his 1100D camera with a Helios 135mm lens (cost £11.50) f3.5 on static tripod at 1600 ISO. He took 40 x 3sec. exposures and processed them in DSS and Photoshop CS2. 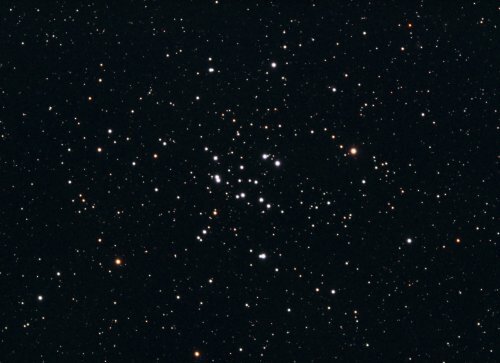 Graham Winstanley took this image of M34. Luminance 20 x 1 min, RGB each 15 x 1 min, taken in moonlight. No darks, 25 flats per filter. Graham Winstanley took this image of Uranus and moons on 16 November 2016. 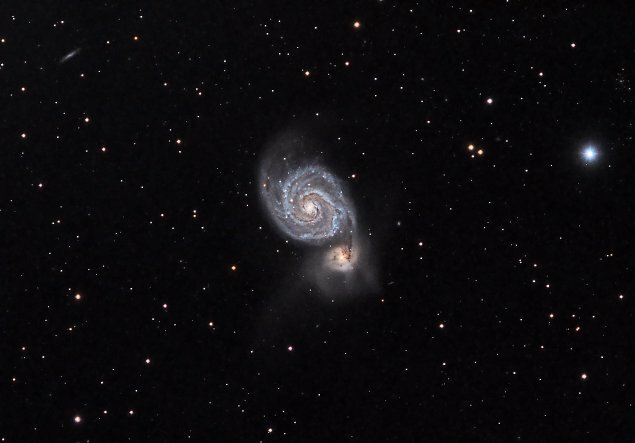 Graham Winstanley took this image of Messier 51 between 27th May and 5th June 2016. 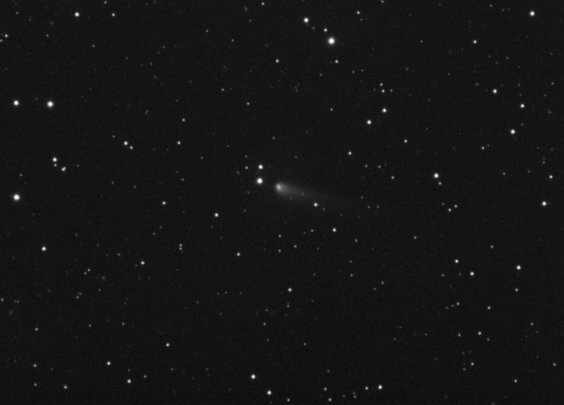 Telescope:ED 80 on an EQ6 mount. 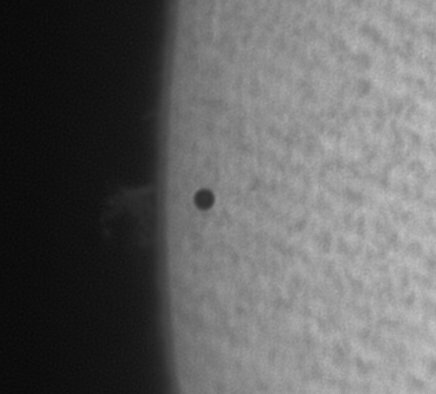 Phil Norton took this image of the Transit of Mercury at 11.20UT on 9th May 2016 through a Coronado PST and a ZWOptics ASI120mm camera. 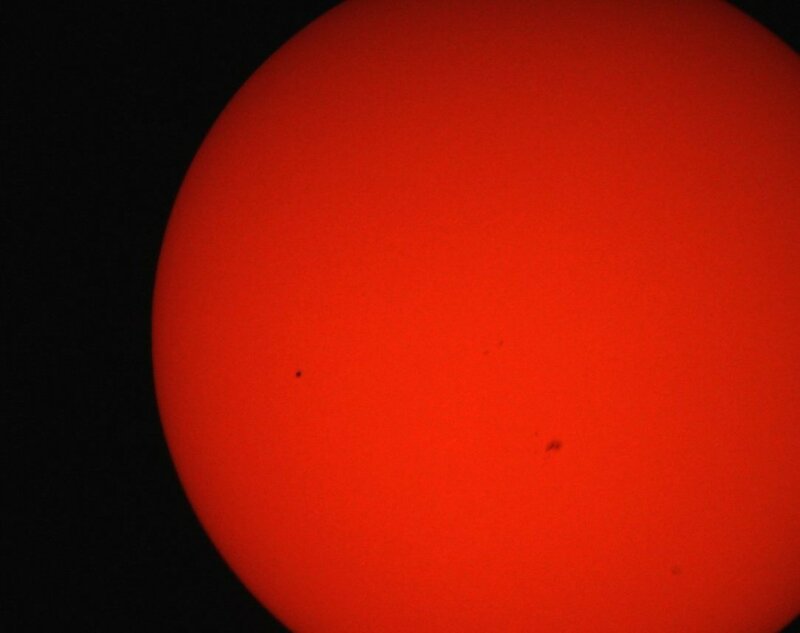 Sarah Bingham took this image of the transit at Tuxford Academy during lunchtime. She used the schools Celestron NexStar 5SE and her Canon camera. Lewis Baucutt has taken this wide angle shot of the observatory with Orion high in the sky. It is difficult to see because of the poorly lit business premises on Long Leys Road in Lincoln. What a waste of electricity. NGC2237 the Rosette Nebula in Narrow band taken by Mick Hunt in his Garden Observatory- March 2016. Despite only managing an hour or so of data capture per session Mick finally managed to get this one finished. 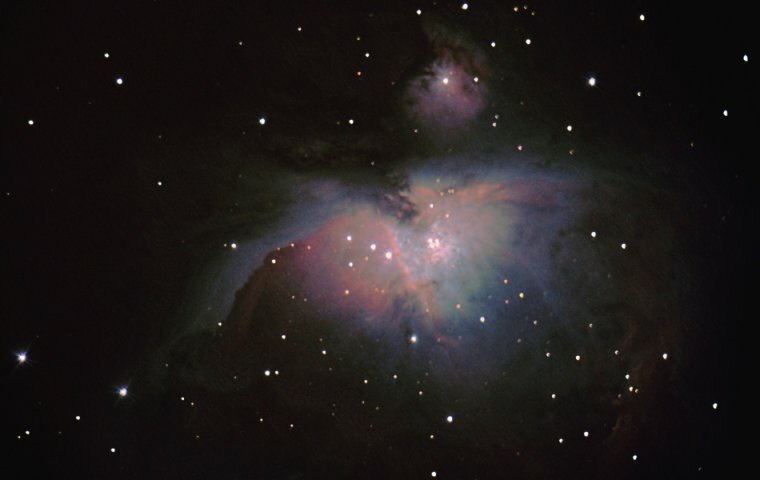 M42 the Orion Nebula taken by Sarah Bingham.This is Sarah's first ever astronomical photograph. 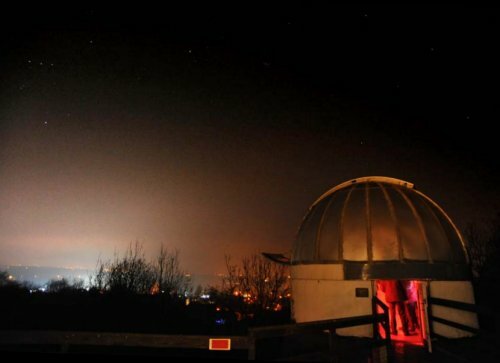 She took it using her DSLR camera on the society 12 inch telescope on a misty 10th March 2016. Training was given by the regular Imaging Group members. 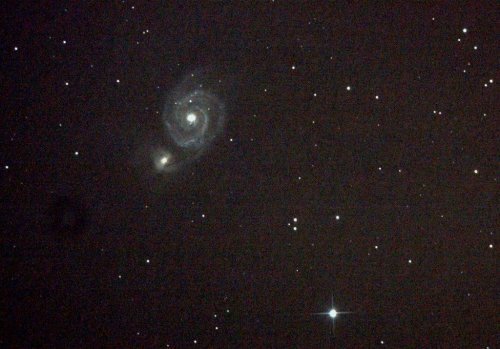 M51 the Whirlpool Galaxy taken by Dave McCracken. Telescope -Explorer 130 P-DS (5”) F5 Newtonian. Imaging Camera - Canon 450D (unmodified). 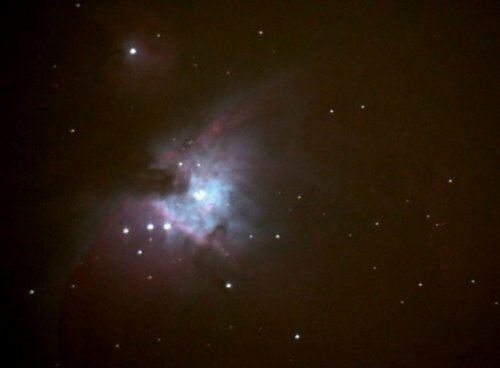 M42 the Orion Nebula taken by Mick Hunt in his Garden Observatory- February 2016. Mick shows the difference between a few minutes of exposure as taken by Neil below and many hours of exposure. 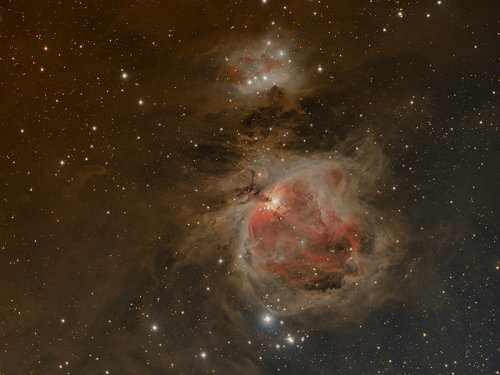 M42 the Orion Nebula by new member Neil Emmans on 11 Feb 2016. The image consists of 10 x 15 secs exposures and a further 10 x 15 secs for darks. 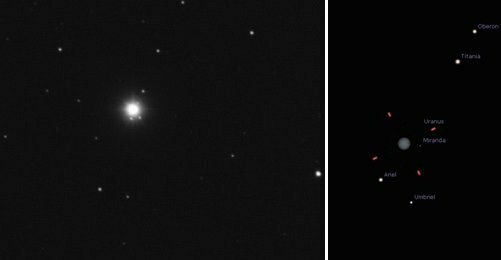 He used a Canon 750d camera at ISO800 on the society 12 inch telescope with no guiding. Processing was using paint.net. 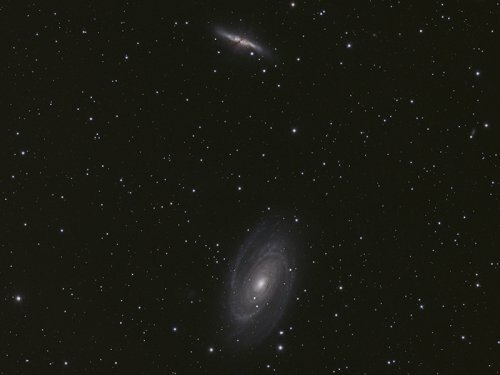 M81 (Bodes Galaxy) & M82 (Cigar Galaxy) taken by Mick Hunt in his Garden Observatory- January 2016. 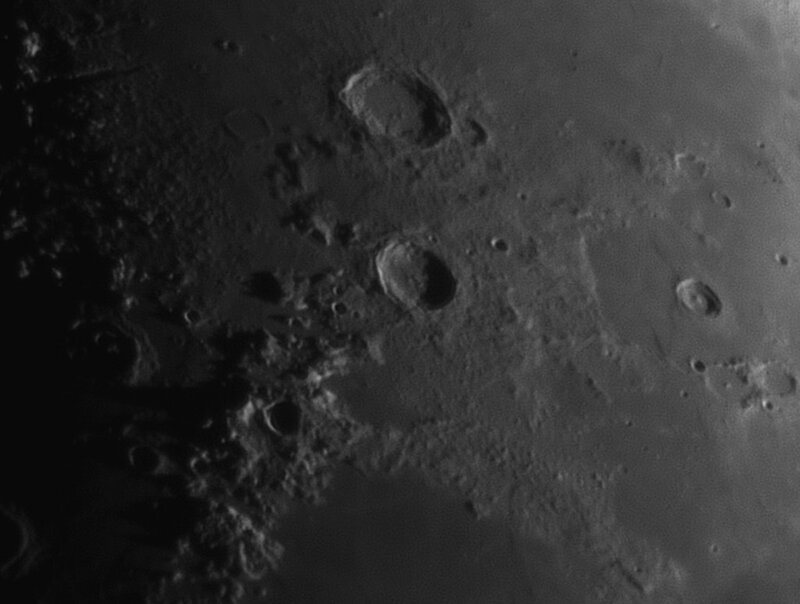 Mare Humorum taken by Phil Norton on 20 January 2016.